HONOLULU —A few months from her 6th birthday, MJ Kaneshiro is bursting with life. But, even in her early years, it’s been a tough life. “MJ’s seizures have been out of control for four years,” said mother Jari Sugano. At four months, she had her first seizure. Doctors later diagnosed MJ with a rare form of epilepsy called Dravet Syndrome. 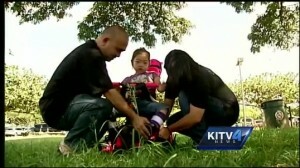 “It’s been a rollercoaster of a ride,” said father Reid Kaneshiro. Through endless hospital visits, treatments and medications, nothing seemed to work until they came across a story of another little girl named Charlotte treated with marijuana. In particular, a strain low in THC, but high in what’s called cannabidiol, or CBD. “It took us a year to realize that our best is not good enough,” said Sugano. “We wanted to inspire people to come out and join us,” said Mark Wu of the Hawaii Cannabis Care. The organization is hosting a fundraiser on Saturday. The family is leaving Sunday for Denver, Colo. to try to get accepted into a clinical trial using CBD. “I feel that we’re blessed. A lot of people, when they found out about MJ, they’re like reaching out and helping us,” said Kaneshiro. “Overall, we’re seeing reduction in her seizures and seeing her cognitive ability improve,” said Sugano. One step at a time is what they don’t have. “I think we’re finally getting momentum,” said Sugano. The couple also has an 8-year-old son who has Asperger’s Syndrome, a form of autism. They might be exhausted, but they say they feel blessed through the love of their children and the help of their community. Hawaii Cannabis Care is holding its fundraiser for MJ on Saturday, Oct. 4 at M Nightclub at Restaurant Row from 4 p.m. to 9 p.m.
Click here to for more information and to pre-order tickets.